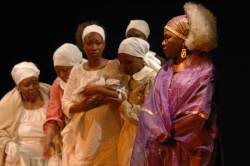 December 2010: Hosted a Three Rivers Theatre Company production of Butterflies Are Free, by by Leonard Gershe, directed by James Edwards. The production featured Garret Storm, Ariel Leasure, Elizabeth Brinkley, and Thomas Kolos. 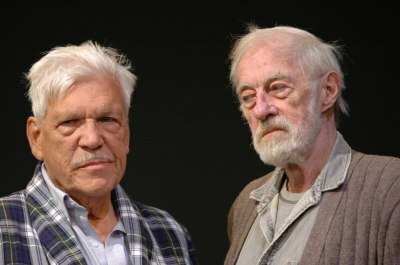 November 11 2010: Benefit Reading of Elder Hostages, a trilogy of one-act plays (Mum’s the Word, Wandering Angus and Night Song) by Ray Werner. Directed by Marci Woodruff, John Shepard and Mark Clayton Southers. With Tom Atkins, Bingo O’Malley, Teri Bridgett and Susie McGregor-Laine. At the New Hazlett Theater. 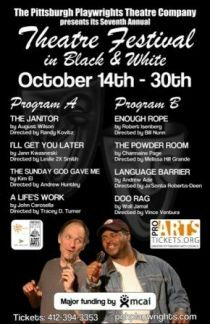 October 2010: The Seventh Annual Theatre Festival in Black and White, Pittsburgh Playwrights’ signature event. Festival Coordinator: Ja’Sonta Roberts Deen. Ran October 14th through October 30th, 2010. The Janitor, by August Wilson. Directed by Randy Kovitz. I’ll Get You Later, by Jann Kwasneski. Directed by Leslie 2X Smith. The Sunday God Gave Me, by Kim El. Directed by Andrew Huntley. A Life’s Work, by John Carosella. Directed by Tracey D. Turner. Enough Rope, by Robert Isenberg. Directed by Bill Nunn. The Powder Room, by Charmaine Page. Directed by Melissa Hill Grande. Language Barrier, by Andrew Ade. Directed by JaSonta Roberts Deen. Doo Rag, by Wali Jamal. Directed by Vince Ventura. June 7 2010: Reading of Breathe, by Javon Johnson, directed by Andrew Paul. Co-produced with PICT. With Crystal Bates, Shelley Delaney, Jaron Frand, Michael Hanrahan, Alan Bomar Jones, and Carter Redwood. 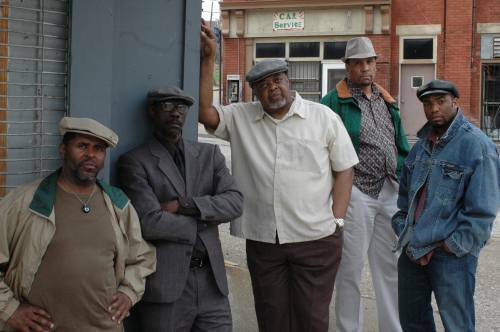 May-June 2010: Jitney, by August Wilson, directed by Mark Clayton Southers, ran May 8th to June 6th 2010. With Sala Udin, Les Howard, Joshua Elijah Reese, Lonzo Green, Alan Bomar Jones, Wali Jamal, Kevin Brown, Jonathan Berry, Genna Styles, Maurice Redwood, Justine Patrick, Marcus Carl Southers, Ja’Sonta Roberts Deen. April 2010: The Ancestor Series, by P.J. Gibson, directed by J. Deen, Kim El, and Leslie 2X Smith, ran April 10th to April 24th. With Stephanie Akers, Chrystal Bates, Le’Naiya Blackwell, Germaine Carter, Twanda Clark, Ja’Sonta Roberts Deen, Kim El, Jacqueline Flowers, Justine Patrick, Laneece Patterson, Vema Sam’i, Leslie 2X Smith, Michaelangelo Turner, Cheryl El Walker, and Mayme Williams. March 2010: VALU-MART, by Sean O’Leary, directed by Mark Clayton Southers, ran March 13th to March 28th. With Bill Dalzell, Tommy LaFitte, Susan McGregor-Laine, Kelly Marie McKenna, Rico Parker, and Genna Styles.